This photo is of my BIL, his wife and my DH's Grandmother on their wedding day. I've used Urban Lily papers, Crafty secret papers, white bazzill, mulberry paper flowers, ribbons and Autumn leaves stamps. The P is Scenic route Jargon rubons. Beautiful! What a lovely photo, such a tender moment. How delicate and beautiful. Well done. Beauitful. The LO so soft has captured the moment in the photo. This is lovely Rondelle - that's a gorgeous photo, really precious! Rondelle, this is just such a beautiful memory to capture. You've done a sensational job. What a special, lovely photo. Your paper just suits it so well. Very soft and precious - just what such a wonderful photo needs! This is incredible Rondelle - it is just fantastic! Gorgeous paper, really suits the precious photo, well done. What a wonderful photo. Your LO is lovely. Rondelle, this is truly beautiful and the hand cutting gives the page such a delicate look. That is a beautiful photo! You have captured the moment so perfectly! 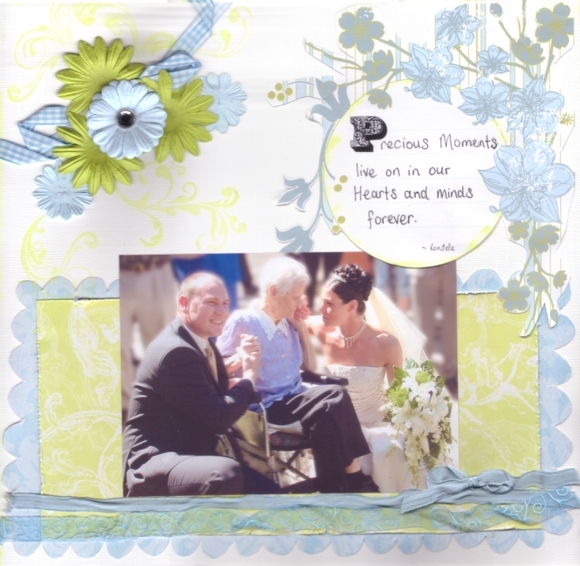 I love the pp you have used, the ribbons and the hand scalloped photo mat. The way you have folded and knotted the ribbons is superb!